With the naturaSign Pad Mobile, the StepOver development team have taken note of the growing trend for ever-larger displays to enable convenient, easy handling. The naturaSign Pad Mobile is specifically developed for the demands of mobile usage, including field sales. 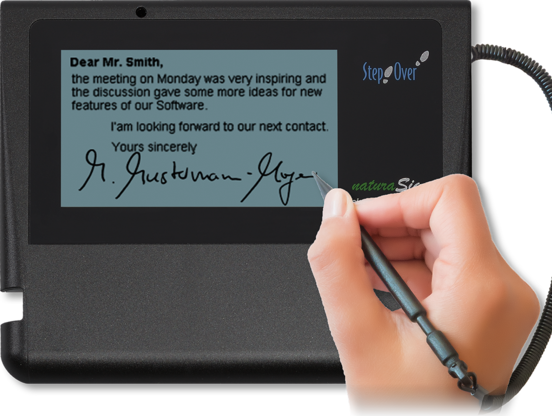 Thanks to the large black-and-white screen, the super-slim design (0,95 cm thick) and its curved edges, the naturaSign Pad Mobile is also an extremely compact, yet sturdy and comfortable, device for signature capture. The enlarged black-and-white screen means that this pad offers even more space for signatures: even scrawled handwriting is no longer a problem. The tried-and-tested "rotate" function enables you to turn the signature line 180°, so left-handers can also sign comfortably. Now you can insert individual text on the screen, as well as position interactive buttons or your company logo. The high-resolution black-and-white screen ensures that your inserts will be clearly displayed. 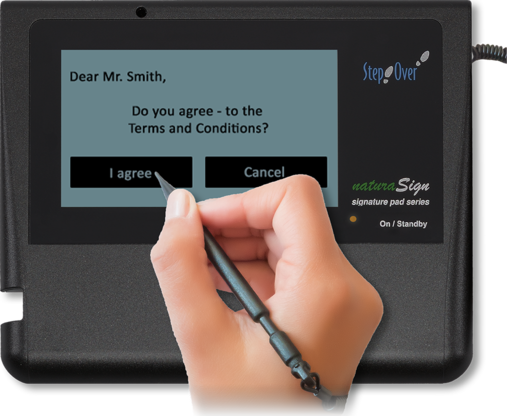 The flat touch display coupled with easy-care casing offers a convenient method of signing, with no sharp edges or corners. Grime doesn’t stand a chance! 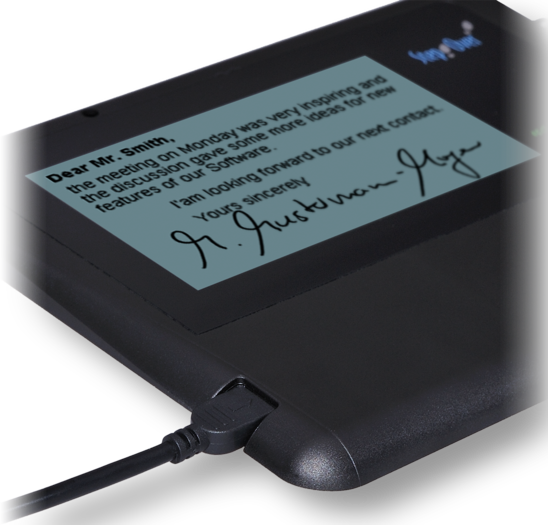 A signature pad with black-and-white screen that’s flatter than a CD case and therefore saves you plenty of space e.g. can be taken with you in a laptop bag. Nonetheless, it’s very stable and meets the demands of daily use whilst on the move! The input for the USB cable protects the connection, especially against pressure applied to the sides. 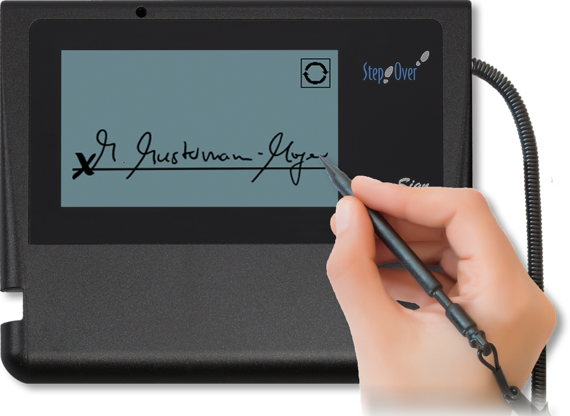 Every StepOver signature pad has a unique certificate for digital signature (2048-bit RSA): through this, it is possible for the pad’s secure internal signature creation unit to sign the relevant document, and later to also unambiguously assign it to a specific signature pad. Furthermore, the signature pad contains a public key from a second key pair, created by a notary public. This key securely encrypts the biometric data of your signature in the pad. In this way, highly sensitive data is never found decrypted in the "unsecured" environment: i.e., your computer. The private key from this second key pair is safely stored with the notary public.